Put shallots, mushrooms and 1 T. butter in a large stainless steel pan. 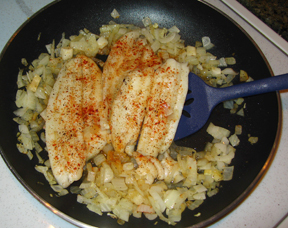 Place salted and peppered Dover sole fillets on top; add the wine and fish broth; cover tightly with lid. Adjust heat to low and poach fillets very gently. Continue poaching frequently checking the fish until it is completely cooked, about 6 minutes. 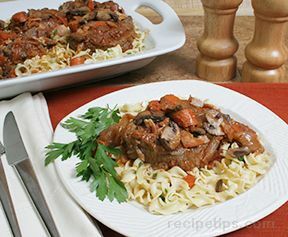 Carefully remove the fillets and mushroom caps to a warm platter, covering tightly with film and keep warm. Place the sauté pan with the poaching liquid over high heat; add the heavy cream and reduce to half (about a cup). Turn heat to low, allow the cream to cool down a bit, then add the mussels and shrimp. Cook until the mussels open and the shrimp is firm, about 4-6 minutes. Place 1 fillet onto each warmed plate with 3 mushrooms, 3 mussels and 2 shrimp per serving. Bring sauce back to a boil, adjust the seasoning with salt and pepper and whisk in the remaining 2 T. butter. Divide sauce evenly over the top of each serving. Garnish with parsley.